There are a couple of products in the Scotch Irish Brewing company's portfolio which I am looking forward to trying. 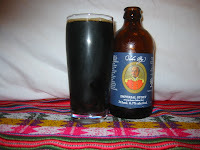 But as this is a seasonal beer, I thought that I would start with John By Imperial Stout. Located in Carlton Place in the Ottawa area, Scotch Irish Brewing was founded by Perry Mason (not that one) back in 2001. The company was famous for his hoppy brewed ales. In 2006, he sold out to Heritage Brewing Ltd, which was a craft brewery in the same area, which specialized in Lagers. His line of ales makes a nice fit for the company. The two companies maintain separate websites, although they both have the same look. Perry stayed on 'til February of 2008, when he left to "pursue other interests". 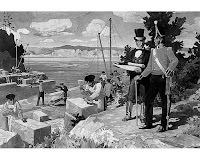 This stout is named after Colonel John By who was responsible for the construction of the Rideau Canal, built between 1826 and 1832, which is considered an engineering marvel of the 19th century. He also is credited for the construction of Bytown, named after him, as a town for workers who were building the nearby locks. The town grew into the city of Ottawa. The maltiness of the beer disguises the high alcohol content and is a wonderful, delicious sipping beer. It pours with a nice thick head, even though my picture does not show it and has a strong malty aroma. The texture is rich, thick and almost creamy. It finishes with a pleasant bitterness in which I felt tasted slightly of bitter chocolate. As it is a seasonal release, I will need to pick up more. I am going to have a blind taste test of my favourite stouts in the new year and this will definitely be a part of it. If you are a Guinness or stout fan, this brew is definitely worth searching out.